Say "good-bye" to shrink bands, heat tunnels, and heat guns. Say "hello" to ClearPac Safe Seal, tamper-resistant, tamper-evident containers. ClearPac Safe Seal's unique, patented design was especially engineered to inhibit container tampering, and also make it clearly evident if a container has been opened. Just how does Safe Seal do it? Let's take a closer look at its design to find out. ClearPac Safe Seal starts out as a one-piece, hinged product, avoiding the problem of mismatched lids and bases. The hinge is also strong and durable, which ensures no unintentional tearing during normal product handling. One simple step is all it takes to close ClearPac Safe Seal. Using two hands, press down on the lid into the container. Slightly angling your palms or thumbs inwards towards the locking post, present in front of our flat lid, 24 through 64 oz. containers, will also ensure that the front locking post engages, in the same motion as it seals, resulting in a fast, effortless one-step closure. Pushing down on all four corners and then dragging the thumbs inwards towards the center of the container is another option. The sizes with the locking post can also be closed by first engaging the locking post and then pressing down on the four corners of the container as is currently shown. A closed Safe Seal container is a tamper-resistant container, due to a host of built-in features that inhibit container tampering. All Safe Seal container lids have a micro-trim edge, which makes it extremely difficult to grab the side of the lid and try to lift it up. Another feature which prevents the ability to grab and lift the lid up, on the flat lid containers, is the raised ring on the lid, called the internal stacking ring. This obstructs the fingers when attempting to grab at the lid and lift it up from the base. On the dome lid, the side wall will serve as the finger obstruction. To further enhance tamper-resistance, the 24 through 64 oz. 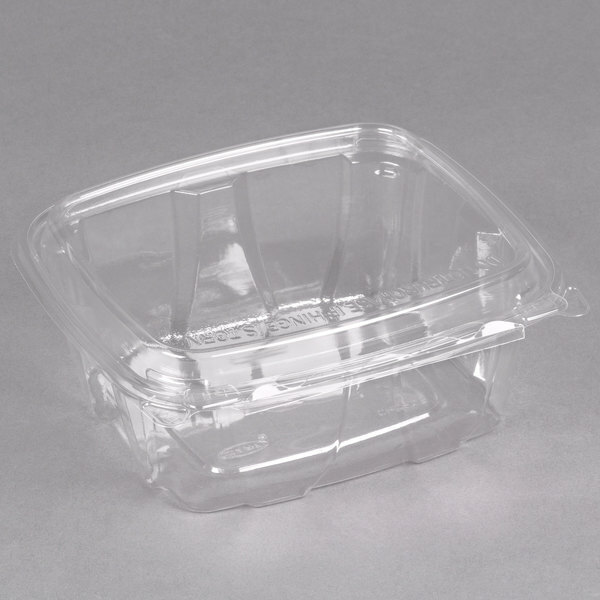 flat lid containers have a locking post, located on the front side of the container. The locking post serves as an extra place where the lid is held down into the base, contributing in the difficulty encountered when trying to lift the lid up from the base. Go ahead and stack them up high. The combination of the recessed stacking platform and internal stacking ring on the flat lid containers, and the recessed stacking platform and dome lid stacking ring on the dome, allow multiple containers to be stacked, one on top of the other, to form a stable, upright stack - even during normal product handling. ClearPac Safe Seal's leak-resistant perimeter seal maximizes product freshness and prevents leaks and spills. And ClearPac Safe Seal remains leak-resistant, even once the hinge has been torn. It's just as easy to open a Safe Seal container as it is to close it. The offset lift and hold tabs with embossed opening instructions facilitate intuitive, easy opening of the container. By simply pulling apart the lift and hold tabs, the perforated hinge tears across, easily and completely. Now, ClearPac Safe Seal becomes a leak-resistant, fully-functional two-piece container, that can be opened and closed multiple times. Not only is Safe Seal tamper-resistant, it's also tamper-evident, due to two key features. The unique, patented, tamper-alert hinge, which is especially-designed to protrude outward if the hinge is torn, and the "Do not purchase" message, which is clearly embossed on the lid. The hinge also remains attached to the container, meaning no loose pieces of plastic and therefore, no littering. And take a look at just how good ClearPac Safe Seal makes its contents look. Minimal side-wall ribbing, maximized product visibility, increasing the likelihood of impulse sales. ClearPac Safe Seal tamper-resistant, tamper-evident containers are available in a total of twelve sizes. The 8, 12, 16, 24, and 32 are available in both a flat and dome lid option. The 48 and 64 are available in flat lid options only. 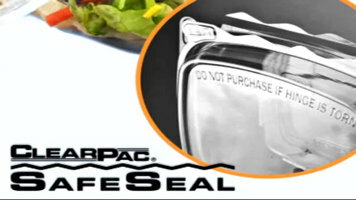 If freshness, safety, and merchandisability are what you are looking for, ClearPac Safe Seal is the container for you. Discover why ClearPac Safe Seal containers are the safe, effective, solution to increasing impulse buys, in this informative video. From patented features to stackability, these containers have a lot more to offer than you may expect. Securely seal sandwiches, pasta or potato salads, granola, nuts and more with the Dart CH32DED ClearPac Safe Seal tamper-evident hinged container. Specifically designed to inhibit tampering, this 32 oz., square container comes with Dart's tamper alert hinge, which protrudes outward when torn - alerting your customers that the container has been opened. 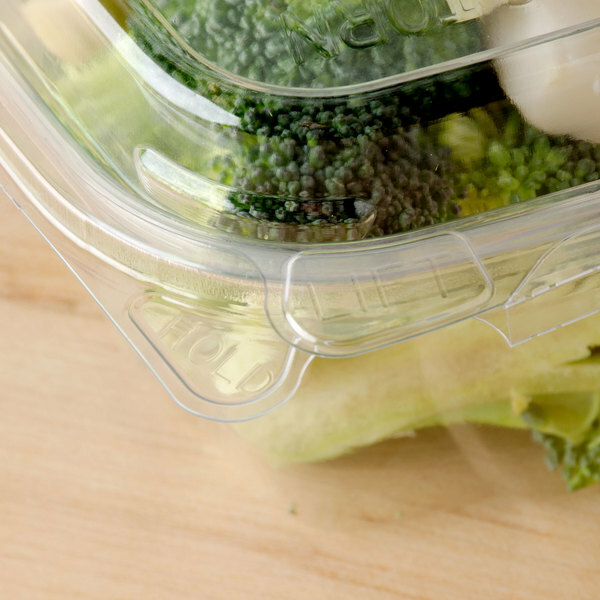 This PET plastic container's tamper alert hinge remains attached to the container, eliminating loose plastic pieces as well as the need for shrink bands and wrap labels - saving your business time and money, and reducing waste. 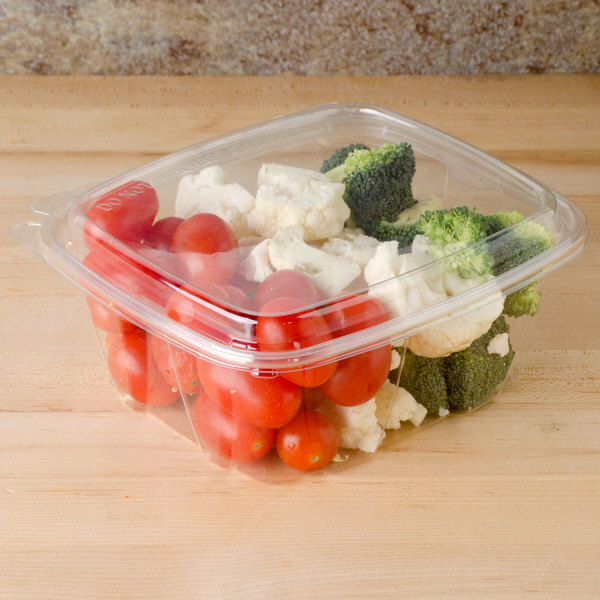 Use this container to hold bulk food, dips, salads, fruits and veggies and more at your deli, salad bar or grab-and-go counter. Perfect size for cookies, and easy to open. Love them, some I have gotten are so hard to open, you almost broke. These are great for taking cookies places. I use these 32 oz containers for my salads and they are really big. They actually are very secure and also the tamper proof really works. 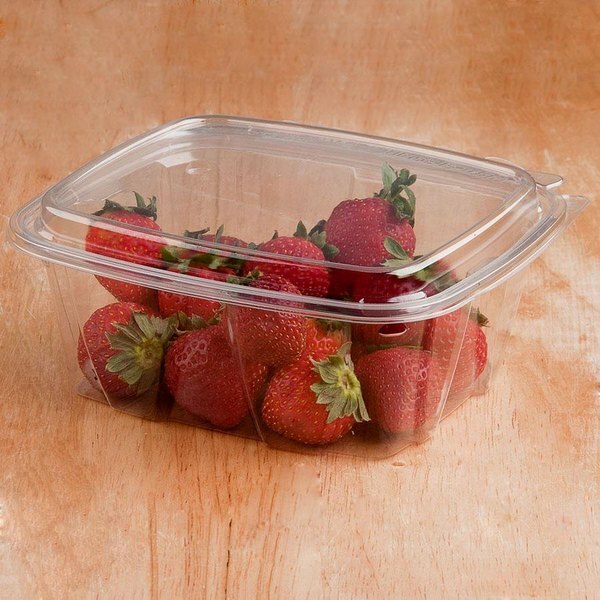 Nice containers with effective closing lid. We like the hinge lid so we don't have to buy two separate items. Holds up to heavy items well. Perfect for keeping all my herbs and spices secure and airtight. Great for transport and on an unrelated side note makes for an easy lego sorting and storage system as well. Lightweight and super versatile! We use this box to package our kale chips. It has a much better airtight seal than other containers we have tried and displays the product wonderfully on the shelf. However, the boxes are easy to open without breaking the tamper proof seal. These are perfect for our use. We use them to put packaged granola and other items in the retail area of our bakery. They are large and seal very easily. The top is flat and large enough to accomodate a label very well. Holds approximately one pound of our granola which I think is important to be able for others to understand how much of something else could fit.